but a long run coming down." The Mullet Marathon is a way of life. It's a lifestyle dedicated to healthy living and inspiring others. Supporting great causes and going the extra mile. Letting your hair down and giving high fives. Big smiles – we firmly believe – equal shorter miles. 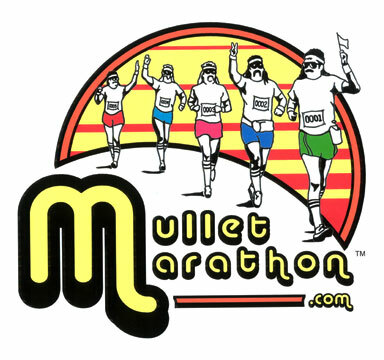 Since 2002, the Mullet Marathon has made appearances at races and events around the country, delivering free high fives while helping raise money and awareness for a multitude of incredible people, charities and initiatives. We're originally from Orlando, Fla., so you may have seen us at a Super Bowl, Daytona 500 or even running around Walt Disney World. We've been fortunate to be on the front page of Yahoo.com and featured on The New York Times website, ESPN.com and several other local and national newspapers, websites and television programs. In 2012 and 2013, the guys ran the 86-floor, 1,576-step Empire State Building Run-Up in New York City to help raise money for the Multiple Myeloma Research Foundation – and achieve "The Highest Five." 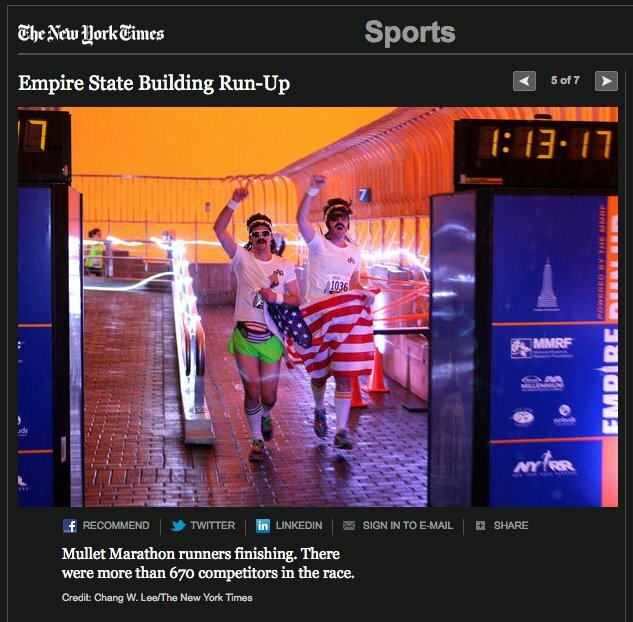 In 2012, The New York Times kindly featured Bobby and Kenny, crossing the finish line at the top of the Empire State Building, on its website. In 2012, Kelly Ripa from "Live with Kelly & Michael" interviewed Bobby and Clark and gave them a high five before the climb (which you can watch in the video to the right; fast forward to the 2:10 mark). Recently, we've spent a lot of time in New England, appearing at at numerous races, parades and events throughout area. Ernie #0001, one of the founders of the Mullet Marathon, recently accomplished the "Goofy Challenge" – running the Walt Disney World Half Marathon and Marathon on consecutive days. You know, it's not work if you're having run. For up-to-the-minute updates on the High Five 5K and our future appearances, please follow us on our Facebook and Twitter pages. If you would like the Mullet Marathon to deliver some smiles, good vibes and high fives to your event, please e-mail us by clicking the button below.